We’ve got some great Sweet Sixteen matchups in store for us this Friday night. However, few can rival the thrills that the Virginia Tech vs. Duke Basketball matchup is bound to deliver. The Blue Devils narrowly avoided elimination in their second round matchup against UCF. After that, will the NCAA sports betting odds refuse to favor them in tonight’s contest? Let’s take a look at tonight’s NCAA basketball betting odds to find out. The Hokies are undoubtedly licking their chops after watching Duke struggle with UCF. Considering that Virginia Tech beat Duke during the regular season, they’re bound to be excited about this matchup. Although Virginia Tech is 3-7 in their last 10 against Duke, they beat them the last time they faced each other and are 2-1 against Duke in their last 3. Looking over the numbers however, it’s clear that Virginia Tech will be at an offensive disadvantage tonight. This is because they’re scoring 73.6 per matchup while Duke is delivering 83.74. Defensively things are clearly more even with Duke allotting 67.6 per contest and the Hokies giving up 61.7. If the Hokies are looking to come out on top here they must find an answer for Zion Williamson. After all, Williamson was one of the hottest players in the tournament through the first two rounds. Players to Watch: Nickeil Alexander-Walker (16.4 ppg, 4.2 rpg, 3.9 apg), Kerry Blackshear Jr. (14.9 ppg, 7.3 rpg, 2.3 apg), and Justin Robinson (13.4 ppg, 3.2 rpg, 5.0 apg). Coming off a game in which they were nearly eliminated, Duke will be looking to bring greater focus to tonight’s Sweet Sixteen matchup. In sum, Williamson played a big part in Duke’s success through these first two rounds. Had it not been for him, Duke would undoubtedly be watching this tournament from home. Furthermore, Duke’s recent loss to Virginia Tech came in a game in which Williamson did not suit. All things considered, it’s clear that Duke is ecstatic to have their young star in the lineup tonight. Although the Blue Devils shooting from outside the arc hasn’t been that great, the fact that their rebounding 41.5 has helped them tilt the scales. They’ll need those rebounds straightaway to come out on top tonight. 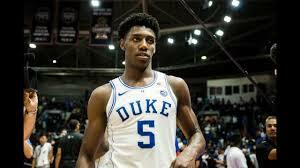 Players to Watch: RJ Barrett (22.8 ppg, 7.7 rpg, 4.1 apg), Zion Williamson (22.5 ppg, 8.8 rpg, 2.1 apg), and Cam Reddish (13.6 ppg, 3.7 rpg, 2.0 apg). So which side should legal betting fans take in this Virginia Tech vs. Duke basketball matchup? All in all, Duke is the best pick in this matchup. Sure the Hokies got the best of them last time but we can’t expect lighting to strike twice here. Sign up today to make your online betting prediction!